IPS is Associate Lead Sponsor at ISS World Europe 2019 - Prague (28-30 May 2019, Clarion Congress Hotel). IPS participates at the WSIS Forum 2019 in Geneve. IPS, also for 2019, will be Associate Lead Sponsor at ISS World Middle East - Dubai (11-13 March 2019). IPS participates at the 4th edition of the LIA (Lawful Interception Academy) in Rome, Italy (7-9 November 2018). IPS is Associate Lead Sponsor at ISS World Latin America 2018 (8-10 October, Panama City, Hilton Panama City). IPS is Associate Lead Sponsor at ISS World Europe 2018 - Prague (5-7 June, Clarion Congress Hotel). 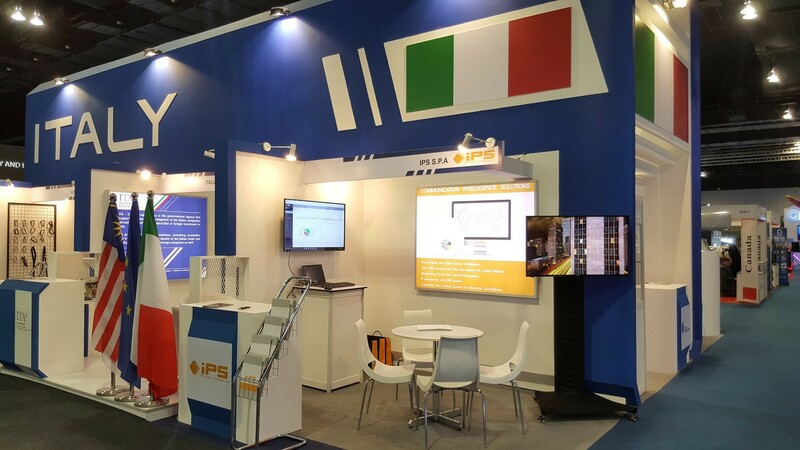 April 18th 2018 - IPS is one of the leading companies at the Italian pavillion, organized by ITA (Italian Trade Agency) during the DSA (Defense Service Asia) exhibition, for 30 years one of the main event in the world on Defense and Security. IPS will be Associate Lead Sponsor at ISS World Middle East - Dubai (12-14 March 2018, Dubai). IPS will participate as sponsor of the event "New interception regulation: protection of privacy and incisiveness of judicial action"
The brand new video of IPS is online! Go check it out on the home page and let us know what you think about it. IPS participates at the 3rd edition of the LIA (Lawful Interception Academy) in Rome, Italy (8-10 November 2017). IPS is Associate Lead Sponsor at ISS Kuala Lumpur (5-7 December 2017, Hilton Hotel). IPS is exhibitor at the next Milipol - worldwide exhibition of internal State security (Paris Nord Villepinte, 21-14 November 2017). IPS will be Associate Lead Sponsor at ISS Latin America (9-11 October 2016, Hyatt Regency - Mexico City). IPS participates at the 16th European Regional Conference of IAP (International Association of Prosecutors) in Tirana, Albania (22-24 May 2017). IPS will be Associate Lead Sponsor at ISS World Middle East (13-15 March 2017, JW Marriott Dubai). IPS will be exhibitor at Security & Policing 2017, that will be held at Farnborough (7-9 March 2017). IPS stand: D40. IPS is Associate Lead Sponsor of ISS World Asia (6-8 December 2016, Hilton Kuala Lumpur Hotel). IPS is Associate Lead Sponsor of ISS World Asia (1-3 December 2015, Hilton Kuala Lumpur Hotel). IPS will be Associate Lead Sponsor at ISS Latin America (20-22 October 2015, Hyatt Regency – Mexico City). IPS is Associate Lead Sponsor at ISS World Europe 2015 (2-4 June 2015, Clarion Congress Hotel – Prague). IPS is Associate Lead Sponsor of ISS World Middle East (16-18 March 2015, JW Marriott Hotel in Dubai). IPS is a partner of the 2nd level Master in “Homeland Security – Systems, Methods and Tools for Security and Crisis Management”, organized by the University Campus Bio-Medico of Rome, in collaboration with the consortium NITEL.